Ultimate is a big claim when it comes to a restaurant. Working with the definition “not to be improved upon or surpassed”, calling yourself the ultimate anything sets the standard of quality pretty darn high. Higher than most places can achieve at Sunday brunch. The Ultimate Café wasn’t even our ultimate destination – we simply headed out in the rain to the strip of King Street West cafes known as “tourist’s row” to see what was open. Looking like the standard late-90s “Italian restaurant from a kit”, the space boasts an exposed brick wall (check), a yellow-ochre sponge-painted wall (check), some vague prints of impressionist fruit (check), and a whole lot of patterned brocade on the seats (check). The ambience deteriorates further upon the realization that while the large doors that run across the full front of the restaurant are wide open, the air conditioning is blasting away inside. Rain-soaked, we sit and shiver, contemplating our share of the restaurant’s carbon footprint and how many polar bears we might be responsible for killing off just by sitting there. The tunage does nothing to distract us from this misery, as the ez-listening tracks come interspersed with actual ez-listening call letters. Yes, it’s the radio – and not even good radio. The menu is interchangeable with a hundred or even a thousand other places offering brunch or breakfast across the city, offering variations on omelettes ($8.99) or fried or scrambled eggs ($7.99 – $12.99). We ask about the quiche of the day ($7.99) only to be told there is none. 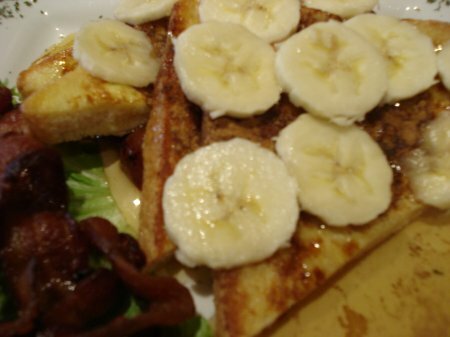 I opt for French toast with fruit salad or bacon ($8.99), asking for bacon and a side of home fries ($2.50). The dish arrives with the thin bread covered in sliced bananas, which don’t show up in the menu description. It would have been nice to know about the bananas beforehand, even though they’re freshly cut and not at all mushy, I could have been a banana hater. Or allergic. The whole dish is already doused in a syrup that might once have travelled past a maple tree, but didn’t really get that close to anything maple, ever, and the early application of syrup means the toast itself is soggy. Surprisingly the bacon hits that perfect level of doneness that is neither too crisp or too greasy. And weirdest of all, the plate of sweet French toast is sprinkled with parsley. Not sprinkled with parsley is the husband’s Ultimate breakfast plate ($8.99) of 2 eggs over-easy, sausage, bacon and toast. The eggs are actually really nicely done, with no burnt edges and no runniness to the whites, while the yolks flow onto the plate when cut. The sausages are just meh, and could have stood to have been flipped while on the grill, since they’re only done on one side. We have differing opinions on the home fries – the husband finding his overly salty, while I’m reaching for the shaker for mine. Overall they’re passable but not memorable. Service through our meal however, is friendly and sweet. Coffee is refilled a couple of times without us having to frantically wave anyone down, and our server is just chatty enough without being overbearing. The deluge outside is going to make for a slow day and we leave a good tip despite not really enjoying the food. 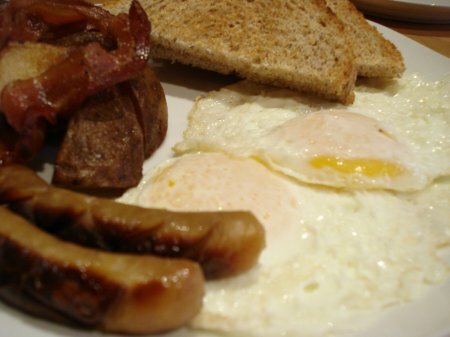 Ultimately (heh), we could find the same quality and quantity of food at any greasy spoon in the city for $3 – $4 less per dish. The Ultimate Café doesn’t offer anything outstanding in terms of their menu, and even the basics are just middle of the road in terms of execution. Tourists in the nearby hotels, or people in from the burbs to see a show in the theatre district might wander in here for Sunday brunch because it’s close and they’re open, but they don’t really offer the ultimate anything, based on our visit.